From the first minutes of this game you hear a very spooky music that alerts you and gets you into an anxious mood. These sounds create a chilling atmosphere all the game through. It becomes clear at once – something terrifying is going to happen here. Having started playing you are getting involved into all mysteries of this rather unpleasant story, which comprises terrible secrets, suspicions, crimes, disappearances and even a murder. With Stray Souls: Dollhouse Story Collector's Edition created by Alawar Friday's Games you will be taken to unknown, mysterious, world where everything is not so easy and understandable as it may seem. 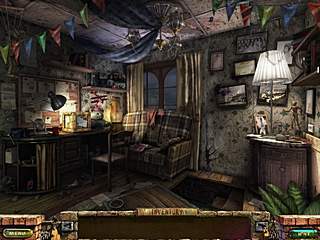 The hidden object areas and puzzles are all round the gameplay. Having found things on each scene you have an item which can be used in solving another problem elsewhere in the environment. First of all you are offered to select a difficulty level (casual or expert) and then to search the room and the basement in order to find the tool you need. 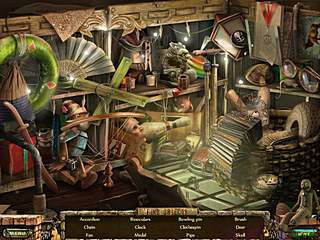 The hidden object areas and puzzles are all round the gameplay. Having found things on each scene you have an item which can be used in solving another problem elsewhere in the environment. You have more than one task that need to be completed in front of you. Be able to figure out how to solve the next questions and the order of doing depends on you. But unlocking new areas is possible after passing through the linear storyline. At the hidden object scenes you can see the whole list of the objects. Us usual, there are a lot of them, but it won't take you long to find everything - objects are clear and in normal size. At list, a hint button may come in handy in each location. For expert players, the hint recharge slows down and twinkling stars that show you where these scenes are in the room are removed. Unexpected appearance of a rag-doll from the box may scare you, but it occurs to become your new friend, that will lead you through your trip and help you much with the information about your husband's past. There is one more feature of this game. Besides rambling back and forth and hunting for clues you are to collect dolls around the different locations. The more dolls you pick up the more facts concerning Samuel the rag-doll reveal you. The graphics of Stray Souls: Dollhouse Story Collector's Edition are wonderful. It is so detailed and helps you in many tasks. Game is worth playing and buying. I did really enjoyed this game! Really great! This is Stray Souls: Dollhouse Story Collector's Edition review. Download this game here.